Approaching Middlebury from the Burlington area on Rt. 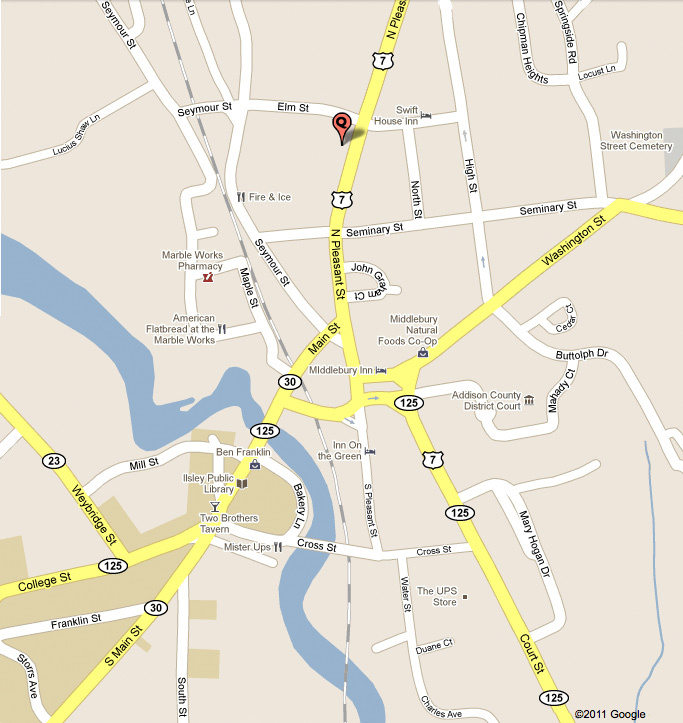 7, you will enter into the downtown area on North Pleasant St. (Rt. 7). After going through the first traffic light, Havarah House will be the second house on your right, number 56. There is room for a few cars to park beside and behind the building; these spots are reserved for our elders. Additional parking is available on side streets, or at the Citgo station one block toward downtown. Approaching Middlebury from the Rutland area on Rt. 7, you go through several traffic lights before reaching the downtown area. Continue on Rt. 7, passing the downtown shopping area and turns for Main Street, Rts. 125 W and 30 S. After passing the Middlebury Inn, Rt. 7 is called North Pleasant Street. After passing the Methodist Church on your right, look to your left for a white house with porch, number 56. The Havarah House sign hangs over the front door. There is room for a few cars to park beside and behind the building; these spots are reserved for our elders. Additional parking is available on side streets, or at the Citgo station one block toward downtown. Approaching Middlebury from the West on Rts. 125 or 30, you will be on Main St. going east. Continue until you reach the intersection with Rt. 7; the white steepled Congregational Church will be on your left. Turn left onto Rt. 7 North (North Pleasant St.) After passing the Methodist Church on your right, look to your left for a white house with porch, number 56. The Havarah House sign hangs over the front door. There is room for a few cars to park beside and behind the building; these spots are reserved for our elders. Additional parking is available on side streets, or at the Citgo station one block toward downtown.